Facing the Atlantic lies the blackhouse village of Gearrannan, an evocative port of call for anyone trying to understand a way of life once very common on Lewis. This is a unique place in a beautiful environment. Although people lived in this area of western Lewis in the Iron Age, as witnessed by nearby Dun Carloway, "modern" settlement here dates back to the 1600s. For over three hundred years people eked out a living here; lived, died, paid their rents, or were quickly evicted if they didn't. The 1886 Crofting Act gave crofters a security of tenure they had never had before, and patterns of living and farming changed as a result. The blackhouses you see in Gearrannan today, though seeming much older, date back only to the end of the 1800s. Perhaps the most remarkable aspect of life in Gearrannan was how far its inhabitants had to go to earn a living. In May 1920, as part of an annual cycle, seven teams of three women from the village left for Stornoway to process fish. They then followed the herring to the east coast of Scotland then down to eastern England, only returning home at the end of the season. In 1934 a team of three sisters from Gearrannan won the title of "Supreme Champions" in Lowestoft for gutting, salting and layering a barrel of herring faster than anyone else. And it wasn't just the village women who were well-travelled: in the 1950s, men from Gearrannan could be found each year in South Georgia in the South Atlantic for the whaling season. Meanwhile life in the village changed only slowly. 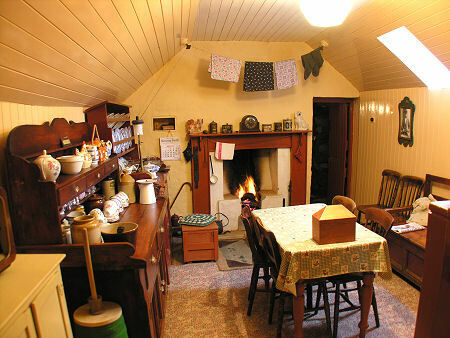 Visitors to Gearrannan can gain an insight into life in the village in the mid 1900s from the museum in the centre of the village. 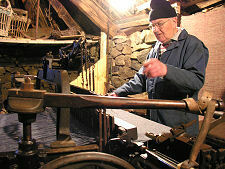 Here a living room and a bedroom at one end of the house are balanced by demonstrations of Harris Tweed weaving at the other. 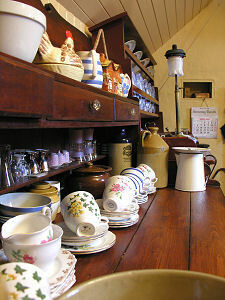 In Gearrannan, oil lamps were replaced by electricity from 1952, and in the 1960s piped water arrived in the village, though it still had to be fetched from outside taps. This brought to an end the tradition of communal washing of heavier laundry in the loch, with water heated over open fires on the shore. And from 1965 a daily milk delivery started, ending the need to keep a cow and grow the crops to feed it. 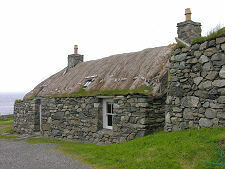 By the 1970s those who could leave had left for easier and more modern accommodation nearby, and only five residents remained in the blackhouses. 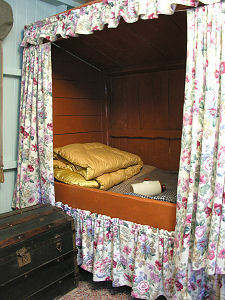 In 1974 the last occupants moved out, leaving the blackhouse village to the ghosts of a way of life now gone. Well, not completely. 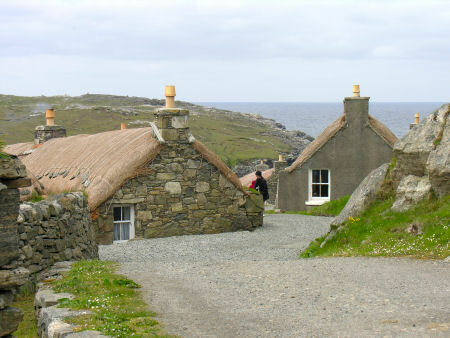 Since 1989 Urras nan Gearrannan (the Garenin Trust) has been painstakingly restoring the once derelict blackhouses and croft land to recreate an authentic settlement offering visitors modern facilities within the surroundings of the original village. 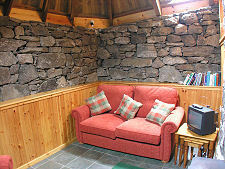 Traditional methods have been used to recreate the drystone masonry and thatched roofing of the original croft houses with the discreet integration of modern conveniences. 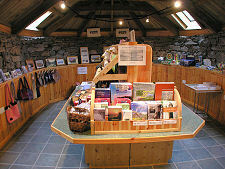 Today the village offers residents and non-resident visitors alike a shop and a café. 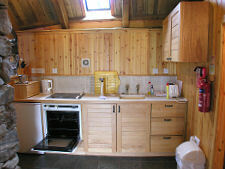 There is also a remarkable collection of self-catering accommodation on offer in the village sleeping from 2 to 16. In the morning you can wake up to the sound of Atlantic waves, while in the evening you can relax in front of a welcoming fire. 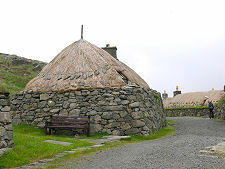 Each blackhouse has its own character, and is named after the family who once lived there. For more information, see the contact details on the right. 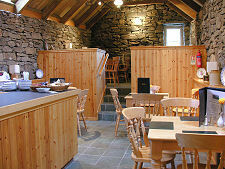 Carloway, Isle of Lewis, HS2 9AL.